Mothering with Creativity: Pumpkin Dog Treats-Easy and Frugal! 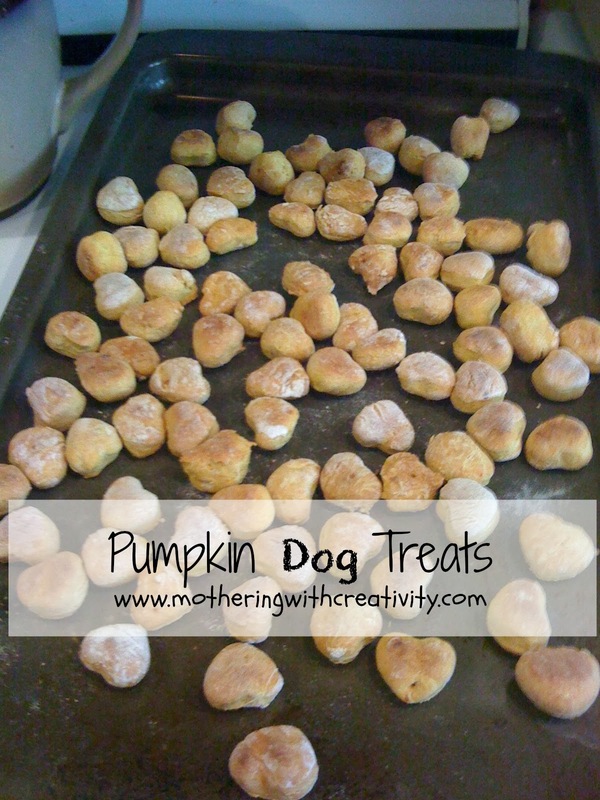 Pumpkin Dog Treats-Easy and Frugal! Stir together eggs, pumpkin, and dry milk powder. Add in the flour. Mix well, using small amounts of water to help it stick together (about 2-3 teaspoons). Roll out the dough with a rolling pin to about 1/4"-1/2" thickness. Cut into shapes using a cookie cutter. We use a small heart shape, but these bone-shaped cookie cutters are absolutely adorable! Bake for 20 minutes at 350 degrees F. Turn the treats over, and bake for another 20 minutes, or until treats are thoroughly cooked and firm. Let cool. We keep ours in a Ziploc bag in the fridge to maintain freshness (these can go bad if not kept in the fridge). How long will they store in the fridge?